Eliseo Cárdenas Sánchez (center) was browsing Facebook late one night in March when he landed on snapshots of his father's identification card and a small pile of bones. His father had disappeared after trying to cross the U.S.-Mexico border in 2008. Eliseo Cárdenas Sánchez was browsing Facebook late one night in March when he landed on a series of photos: snapshots of his father’s identification card and a small pile of bones. Cárdenas Sánchez suddenly realized he likely was looking at all that was left of his father, Eliseo Cárdenas Zetina, who disappeared after trying to cross the U.S.-Mexico border in 2008. “It was 2 or 3 in the morning, and I called the number that was posted with the photographs,” said Cárdenas Sánchez, who lives in Ciudad Juárez, a Mexican city near El Paso, Texas. Soon he was talking with Cesar Ortigoza, the man who found his father’s remains in the Arizona desert. 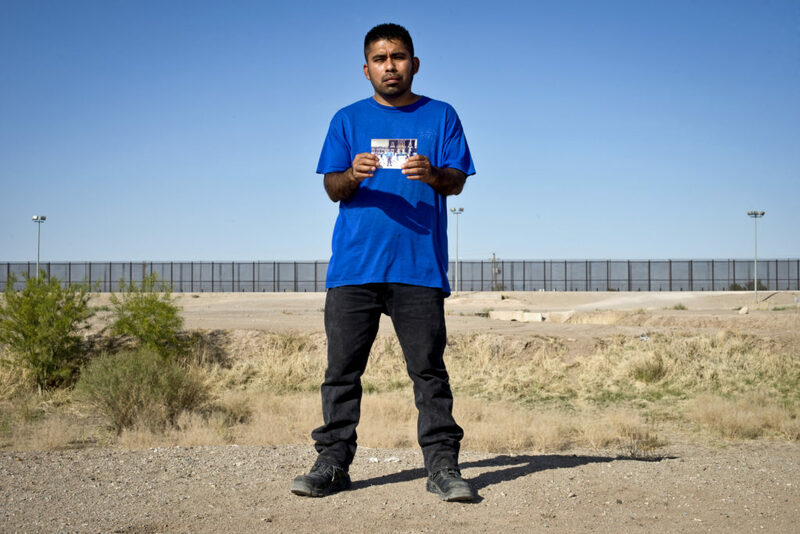 Ortigoza lives in Vista, California, and helped found Los Armadillos, a volunteer group of about 15 people who scour the southern border to find people who are lost or have died crossing into the United States. Los Armadillos is one of a handful of similar groups that have a prominent presence on Facebook. Ortigoza said he gets up to six requests a day from people in Latin America, sometimes as far away as Brazil, about friends and relatives who went missing while they were crossing. Family members share whatever information they can about their last known whereabouts in the desert, and Los Armadillos attempts to find them. Sometimes, the group finds remains with markers such as specific clothing that help identify an individual who died on the journey. Ortigoza estimates that in the five years since its founding, Los Armadillos has found about 90 individuals. Less common is an anonymous tip from someone who crossed the desert and spotted a body, the kind of tip that led Los Armadillos to find Cárdenas Zetina’s remains. Ortigoza said the tip for where to search for the remains came from a man who’d crossed the desert seven years ago, saw a body in a cave in a plastic bag and kept it to himself, fearing that reporting it could lead to his own deportation. Los Armadillos searched twice in March with no luck. Later that month, group members found the remains on the Barry M. Goldwater Air Force Range, about halfway between the border and Phoenix. Ortigoza said bits of weathered black plastic were under the bones. Many of the bones appeared scattered and ripped apart. Cárdenas Zetina was 53 when he crossed a decade ago. Relatives tried to dissuade him from making the trek, but he’d made up his mind to go north for work. 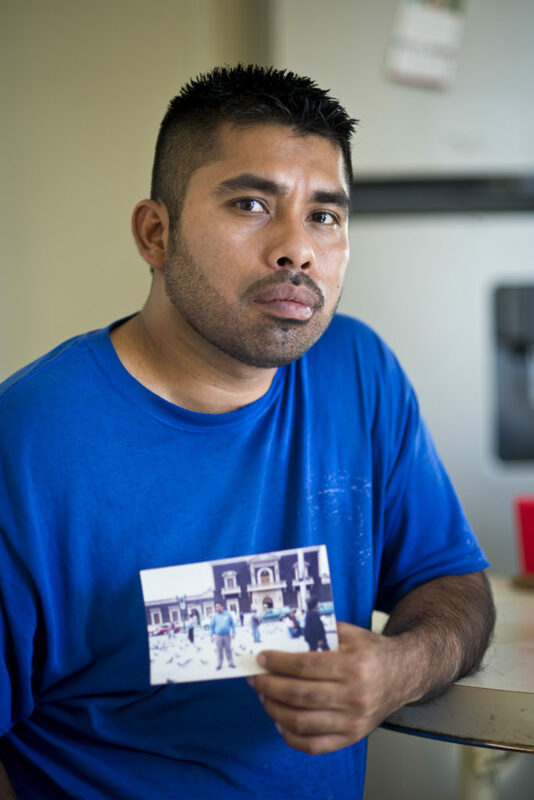 Cárdenas Sánchez lived in Mississippi at the time but was deported a year later and never returned to the U.S.
Cárdenas Sánchez said he’d been told by a man who crossed with his father that one day, his father wanted to stay behind to rest while others kept walking. 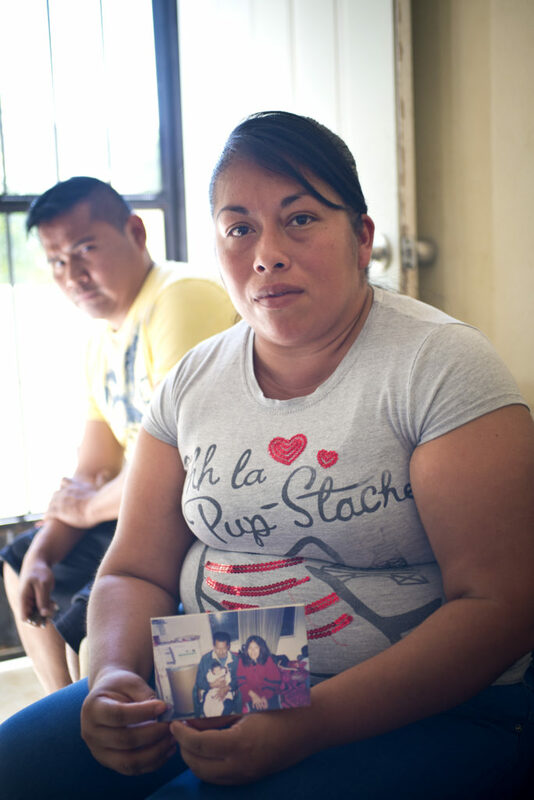 Cárdenas Zetina’s five children had held out hope that their dad was still alive. It took a while for the family to come to terms with the fact he had lost his life so long ago. Los Armadillos alerts U.S. Customs and Border Protection and other officials about the group’s trips, assuring authorities that they’re familiar with and respect all laws. They carry white flags and wear bright orange sweatshirts to avoid being mistaken for border crossers. After going undiscovered for so long, it’s unlikely Cárdenas Zetina’s remains would have been identified under most circumstances. But they were found in a cave, which protected his laminated ID card from the sun. The National Missing and Unidentified Persons System, or NamUs, which connects missing persons cases with unidentified remains, will need to confirm the match, and it’s a lengthy process. Reveal from The Center for Investigative Reporting has developed a searchable database that allows users to search for potential matches. The tool is currently available only in English. NamUs allows users to navigate online in Spanish. Ortigoza himself crossed the border without authorization at age 15 in 1989 – a time when it was much easier to do, he said. As a child in Mexico City, he couldn’t see a way to continue his studies and pursue his dream of becoming an architect. Without informing his parents, he decided to head north alone. Still a minor, he worked as a gardener in San Diego for several years. Ortigoza eventually learned English and completed his high school education as an adult. After marrying a U.S. citizen, he was able to become a citizen. Cárdenas Zetina died in 2008. That year, the Border Patrol recorded 385 deaths and 705,005 apprehensions on the Southwest border. Ten years earlier, 263 people were documented as dead and 1,516,680 were apprehended. But the government’s numbers aren’t always accurate. Ortigoza points out that the increase in border fencing and surveillance forces migrants to take riskier routes to their destinations. “The entire border is a carpet of human remains,” he said. Now 44, Ortigoza works full time as a maintenance man, spending his free time coordinating Los Armadillos, which largely is funded by individuals. He rejects the idea of securing funding from governments on either side of the border. Two weeks after Los Armadillos found Cárdenas Zetina’s remains, President Donald Trump issued a memo stating that the “security of the United States is imperiled by a drastic surge of illegal activity on the southern border,” directing Defense Secretary James Mattis to deploy National Guard troops to the region. The move alarmed advocates. Vicki Gaubeca, who works with the Southern Border Communities Coalition, said Trump is creating a false narrative that counters the realities she knows about the border. She cites the decline in border apprehensions and lower crime rates in border cities as proof that the region is already safe. The promise of a $25 billion budget for increased border fencing in exchange for protecting some young immigrants is no longer an option to fulfill Trump’s campaign promise to build a wall. The House Appropriations Committee approved a spending bill last month that includes $5 billion for 200 miles of wall to be built. In June, 11 governors, including two Republicans, pulled their National Guard troops from the project in opposition to the Trump administration’s policy of separating children from their parents at the border. Los Armadillos finds people and their remains most often in rugged and steep terrain, areas where Ortigoza said Border Patrol agents are unlikely to monitor crossings. Treacherous landscapes offer the advantage of being undetected by authorities. But they also make crossing a lot more dangerous. According to GPS coordinates provided to Reveal by Los Armadillos, Cárdenas Zetina likely trekked across Pima County, Arizona, before crossing into Maricopa County. He may not have known it before he died, but Cárdenas Zetina was about 3 miles from a highway where he could have flagged down help. Local sheriff’s deputies retrieved the remains found by Los Armadillos and delivered them to Christen Eggers at the Maricopa County medical examiner’s office in late March. Cárdenas Zetina’s daughter Belén Cárdenas Sánchez said Mexican authorities obtained a DNA sample from her in late May. Eggers received the sample in June and sent it, along with the skeletal remains, to the University of North Texas Center for Human Identification; the lab provides forensic services to NamUs free of charge. After multiple media requests over more than two months, the Mexican Consulate in June acknowledged a tweet sent by Reveal requesting comment on the case. But it hasn’t answered questions about why the process has taken so long on its end. The University of North Texas lab can establish the familial match, but the process takes about six months. Once a match is confirmed, the Mexican Consulate will obtain the remains and be responsible for repatriating them. That means the earliest Cárdenas Zetina’s remains could return home would be December. 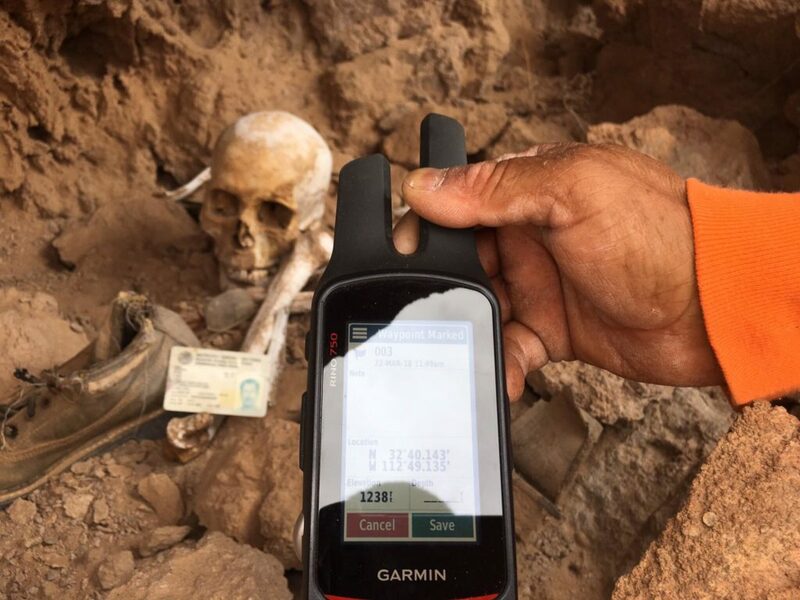 Ortigoza has found six more sets of remains since finding those of Cárdenas Zetina. His commitment to voluntarily search the desert was hampered for a few weeks when the truck Los Armadillos uses for its missions broke down. The group had a tough time pulling together funds but got the truck running again. Ortigoza said Humberto Palos, the mechanic who fixed it, was so moved by the work Los Armadillos performs that in addition to fixing the group’s truck, he’s lending a second one for searches. One set of remains Los Armadillos found in May in Organ Pipe Cactus National Monument in Arizona included what Ortigoza described as a tiny spinal column. A child, he believes, of about 6. The National Missing and Unidentified Persons System, or NamUs, which connects missing persons cases with unidentified remains, will need to confirm the match, and it’s a lengthy process. Reveal from The Center for Investigative Reporting has developed a searchable database that allows users to search for potential matches. The tool is currently available only in English. NamUs allows users to navigate online in Spanish, but the mandatory registration on a U.S. government website might discourage some users.